Sorry I missed writing last week. I was out-of-town, traveling for business. Whenever I do so, I try to book myself in hotels that have those mini suites that include a refrigerator and an induction stovetop. Makes life on the road sooooo much easier, at least in the food department. I get to control what I eat and what goes into it. Traveling is stressful enough…adding eating out throughout the duration gets old quickly, not to mention the temptation of ordering not only an entrée but also an appetizer, and heck, if they have it, a vegan dessert. So, eating in, even while traveling is always key for me. I keep the meals simple yet, sometimes, they turn out quite elegant, if I may say so myself. 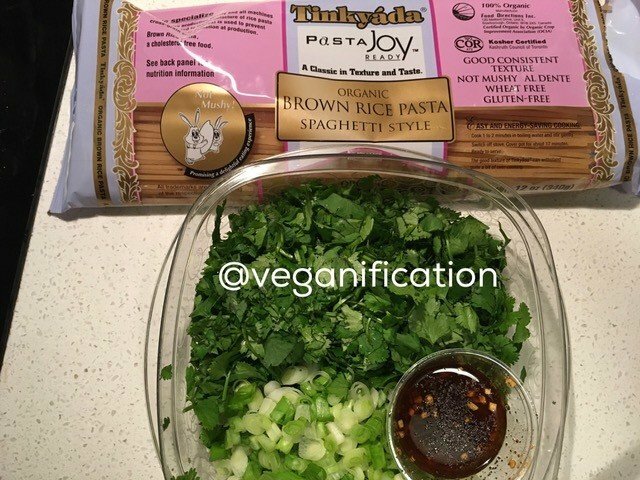 This quick and easy pasta dish is just one of those meals. 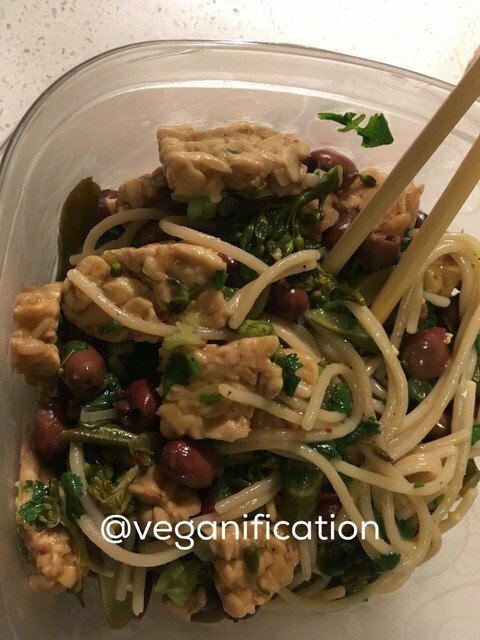 I felt like I was eating in a five-star vegan restaurant, yet it was cooked in my hotel room on an induction burner, and served to myself in one of those plastic refrigerator storage containers (okay, the storage container wasn’t the best option, but it was all that was there). 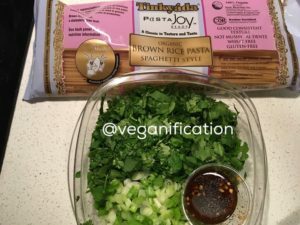 I went into the local Whole Foods Market, where I purchased a package of brown rice spaghetti pasta, a bunch of mini broccolini, a bunch of cilantro, a bunch of scallions, a package of three-grain tempeh, and a small jar of Kalamata olives. I grabbed a salad dressing to-go container from their salad bar, and asked the person behind their sushi bar if I could have about a tablespoon of sesame oil, to which she gleefully poured it into the container. I added to the pool some black pepper, crushed red pepper, and minced fried fresh garlic from the same bar. In a second salad dressing container, I poured about a tablespoon of olive oil and about 2 tablespoons tamari into a second salad dressing container. Off to the cashier I went. Once in the hotel room, I put a pot of water on the stove to boil and cook the pasta (the hotel room comes with some salt and pepper, so I used the salt to salt the water once it came to a boil). While that was being taken care of, I did my mise-en-place, washing the veggies, slicing the broccolini and separating it into one pile of stems and the other of florets, chopped the cilantro, sliced the scallions on the diagonal, and sliced the tempeh into ¼-inch strips. 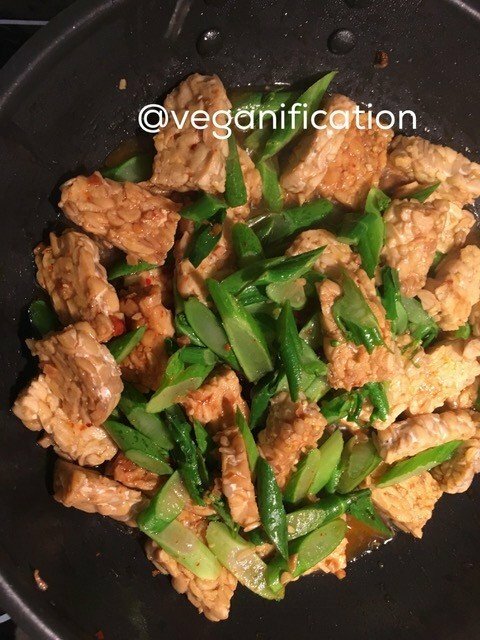 Now ready to cook, I poured the container of oil and tamari into a sauté pan on medium-high heat, adding in the tempeh. I cooked the tempeh until well coated and warmed through, then added in the broccolini stems, covered the pan, and allowed it to cook for 3 minutes, then added in the florets along with approximately ¼ cup of the pasta water. 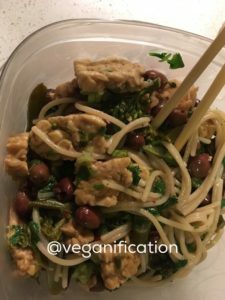 When the pasta was done, I drained the pasta and put it back into its pot, then added the veggies and tempeh along with the cilantro, scallions, olives, and the sesame oil and seasonings from the second salad dressing container. I tossed to evenly coat everything, then served it up. In under twenty minutes from start to finish, I had prepared my dinner. Couldn’t be any easier than that. And what a delectable dinner it was! So, when you’re traveling, don’t always feel that you are relegated to over-salted, way-too-much-fat meals that would not typically be on your menu at home. Mix it up. 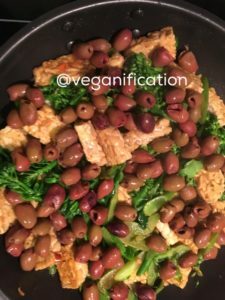 You can enjoy you vegan meals at the local restaurants as well as feasting on healthful, nutritious, and delicious meals that you whip up right in your hotel room!